What it is: A television show based on the book series by Lemony Snicket (well, actually by Daniel Handler—it’s a whole thing). Despite being literally a series of unfortunate events, it’s a comedy series! Neil Patrick Harris sings a song and everything. What I’ve watched: Finished the entire first season last night. Quick thoughts: Did you watch Edward Scissorhands as a kid and still feel a little sad that Tim Burton will never make a movie like that again? Are you a little bit of a sucker for stories that include international conspiracies and secret societies? Do you want to watch several hours of horrible things happening to children? Good news! Besides being a visual treat courtesy of Pushing Daisies director Barry Sonnenfeld, every single actor in the show has a ton of fun. Patrick Warburton’s deadpan Lemony Snicket is an unexpected joy—I never knew how sorely I needed to see him wryly explain the meaning of dramatic irony before I watched him do it on this show. Neil Patrick Harris as the evil Count Olaf is right on the edge of chewing scenery at times, but the fantastical nature of the show matches his hammy-ness. 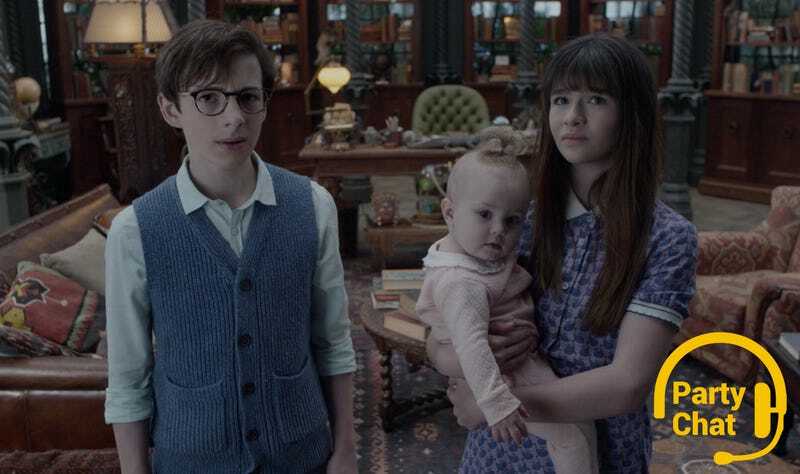 While the three child actors who play Violet, Klaus and Sunny Baudelaire are charming and capable, the real treat are all the guest stars. From Alfre Woodard playing the perpetually terrified Josephine Anwhistle, to Will Arnett and Cobie Smulders as two parents breaking out of jail in Peru, there is a new performance full of warmth and humor in every episode.